Published by Paul John Single Malt Whisky, India on May 25, 2017. Paul John Single Malts continue their sparkling run by bagging more awards for their celebrated expressions. The most recent honours were achieved at the World Whiskies Awards 2017, an international competition set up to choose the world’s finest whiskies. The Paul John Peated Select Cask was declared the Best Indian Single Malt. While Paul John Brilliance and Paul John Classic Select Cask were awarded Gold and Silver respectively. 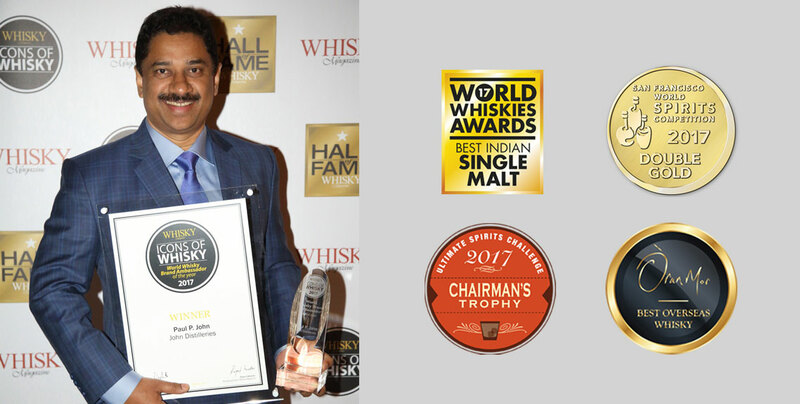 Furthermore, Mr. Paul P John, Chairman of John Distilleries and the man behind the Paul John Single Malts, was declared the World Whisky Brand Ambassador of the Year, one of the most prestigious awards to be won. He was lauded for his entrepreneurial skills and passion for premium products. At the recent San Francisco World Spirits Competition (SFWSC), 2017 the Paul John Single Malt Whiskies brought home five prestigious medals. One of the most prestigious and influential spirit competitions in the world, the SFWSC awarded us with three Double Gold and two Silver medals. The double gold medal winners are considered to be among the finest whiskies in the world. Our Bold, Edited, and Peated Select Cask expressions received the Double Gold medals, and the Paul John Bold was also proclaimed the “Best Other Whisky” by the judges, from over a 100 entries. Additionally, the Brilliance and Classic Select Classic expressions received Silver medals, given to outstanding spirits that show refinement, finesse, and complexity. Of the other prestigious awards won by the brand this year the first was at the Òran Mór Annual Whisky Awards, held at Glasgow, Scotland. The 10th annual Òran Mór whisky awards was held on the 23rd of February, and Paul John Brilliance was proclaimed the Best Overseas Whisky. The unpeated single malt, which has previously won many awards, was commended for its sweet fragrance, honey-like smoothness and a beautifully relaxed finish. The Paul John Single Malts were also honoured at the American Ultimate Spirits Challenge 2017. This world-class event, judged by renowned experts who define the platinum standards for the industry, was led by F. Paul Pacult, known as the “Spirits Guru” of America, and is a life member of Kentucky’s Bourbon Hall of Fame. At this year’s event, which concluded on the 29th of March, he awarded the Chairman’s Trophy in the World Whisky category to Paul John Peated Select Cask, from among finalists like Armorik Classic and Bastille 1789 from France and Kavalan from Taiwan. The Peated Select Cask, known for its crisp layered flavours and delicate smokiness, was also given an “Extraordinary, Ultimate Recommendation” and an excellent 96 point rating. For further details please contact the John Distilleries corporate PR office at publicrelations@jdl.in.